It's been awhile, but the sands of the Endless Desert beckon once more. Today I have the next installment of my unofficial Age of Sigmar rules supplement, Vital Objectives. This provides you a dynamic and fun new way to play your games of AoS. Anyone who has played 7th edition 40k will be familiar with the concept of Vital Objectives. In fact, the 40k Tactical Objectives were a direct inspiration for this and were used as a strong guide. I didn't want to just take the 40k objectives though and plop them into AoS. A good half of the objectives were too specific for 40k, and with the keyword mechanic in AoS I knew I could make some interesting objectives better suited for the Mortal Realms. The basic idea of this ruleset is that you place 6 objective markers around the board before the game begins. Then each turn you generate three Vital Objectives from the table, each of which will have a different objective to complete and a different amount of Victory Points awarded. When using this ruleset the normal Victory Conditions are ignored, and instead the player with the most Victory Points at the end is the winner. Some of the Vital Objectives are as simple as capturing Objective Marker 3, while others involve you killing an enemy model with the Hero keyword, or dispelling an enemy spell. You check to see if you have achieved any objectives at the end of your turn, tally up those Victory Points and then discard that Vital Objective. You can also discard up to one other Vital Objective you did not achieve if you wish. This way you are not stuck with an objective for the whole game that you know you won't be able to achieve. At the start of your next turn if you do not still have three objectives you generate some new ones until you have three active ones. who ever has the most Victory Points at the end of six Battle Rounds wins. This creates a fast and fluid game where you need to be ready to react to changing conditions at a moments notice. In my test game my opponent had only a few small units and when he had to suddenly change directions to go capture an objective marker back in his deployment zone that effectively took that unit out of the game for a turn or two. I would highly recommend picking an army with either a healthy selection of faster units such as cavalry or flyers, or making sure you have enough units that if one has to suddenly move the other direction it doesn't cost you the game. Mobility and flexibility are key. You can also go a turn or two without claiming any Victory Points and then all of a sudden get a bunch. For example, I had a Vital Objective that required me to kill an enemy model with the Priest Keyword. I also had one that required me to kill a model with the Hero keyword, and I got extra Victory Points if the model that killed the enemy model also had the Hero keyword. I tried to claim this objective for a turn or two before I finally managed to kill my friend's Slaughterpriest with my Lord-Celestant netting me about four victory points. It was a definite highlight moment of the game and ended up securing me the victory in the end. It also almost didn't happen and the longer that I held onto those objectives the more risk I put myself in of not getting any Victory Points. I hope that by using this ruleset, not only will you have a brand new way to play out your battles in the Mortal Realms, offering brand new tactical opportunities, but that you will get to create these "oh yeah!" moments yourself. While these rules are presented to be used on their own, I do make reference to specific Battleplans calling for their use. If you haven't guessed it already, my next project is a Battleplan that makes use of the Vital Objectives ruleset. I also hope this inspires people out there to create their own Battleplans that utilize these rules. Perhaps the specific scenario objectives award you extra Victory Points, or they require you to keep your Vital Objectives secret from you opponent, or have you generate more than three Vital Objectives a turn. There are a lot of fun options out there for customizing these further. 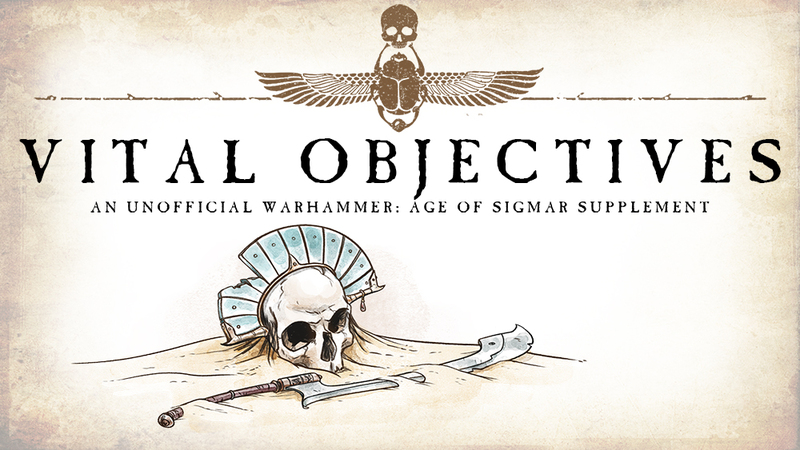 Below is the PDF for the Vital Objectives, including how to use them in your game and the full list of objectives you can generate each turn. I plan on creating a version of the objectives that can be printed out and cut into cards at some point in the future. This way you don't need to roll on the table, and instead can just draw from the deck. You may have noticed those super cool and nifty filler illustrations scattered throughout the ruleset. Those are the work of Kenneth Erickson, a very talented illustrator who graciously offered to help me with this supplement. You should expect to see even more work from him in future supplements, including the compiled version that I will be releasing once all of the separate parts are done. I am particularly excited about this since it will also contain a narrative running through everything telling the story of Lord-Celestant Nihlus Tidalborne's efforts to recruit the reclusive Tomb Kings to Sigmar's cause. My goal is to make this as similar to an official GW campaign book as I can in look and feel. This is where the majority of Kenneth's work will be shown off and having seen the preliminary stages of a few of them I have to say you're in for a treat! You can find his official website here and follow him on Instagram @kenquistador. I hope you find these rules as fun as I did. I would like to thank my small group of play testers who took a look at these rules, tried them out, and gave me feedback on how to improve them. If you would like to be a play tester for my next set of rules shoot me an email at tylerm@mengelminiatures.com.